Apple PowerBook is the new ticking timebomb. As most of the Apple Fan believed their Apple computers as time-tested,highly efficient and far superior than others, it's a big punch on their belief. 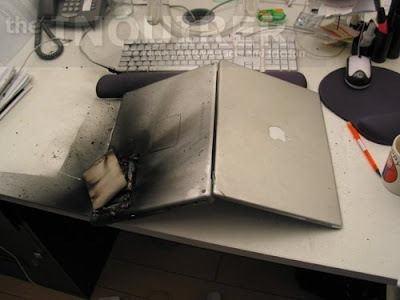 Last week on Thursday, as reported by The Inquirer, the Apple PowerBook exploded for no reason inside the office of local UK-based Marketing company. Luckily no one was hurt. This kind of incidents of self-exploding battery-powered gadgets are not new. Many reputed cellphones have exploded in the past. Few weeks ago, A Chinese man was killed by the cellphone explosion. As always, companies blamed on low-quality cheap battery used. But, what's up with this Apple Powerbook? That had genuine battery and it's one of the expensive thing of it's time comparatively. So much to pay for crap-happening like this?? Whatever,Apple is in the bandwagon after Nokia,Ericsson ..